Jones (leg) logged three tackles (one solo), one pass defended and one interception, which he returned for a touchdown before exiting Sunday's 42-17 loss to the Bills due to a leg injury. Jones is questionable to return to Sunday's game against the Bills due to a leg injury, Joe Schad of The Palm Beach Post reports. Analysis: Jones sustained a leg injury during the third quarter of Sunday's contest. 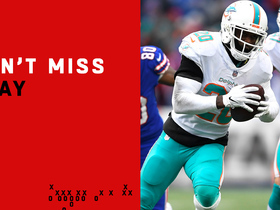 The veteran playmaker scored a pick-six to close out the first half, and would be a notable loss to Miami's secondary if he were unable to return. Cornell Armstrong will start at strong safety as long as Jones remains sidelined. Jones will remain sidelined during at least the first quarter of Sunday's game against the Packers, Joe Schad of The Palm Beach Post reports. Analysis: Jones will sit out the beginning of Miami's game against the Packers in Week 10 as an attempt to discipline the starting safety for his decision to remove himself from a Week 9 win over the Jets. It remains to be seen whether Jones will receive a full defensive workload when he does suit up Sunday. Jones removed himself from Sunday's 13-6 win over the Jets, but coach Adam Gase relayed that the safety will suit up Week 10 against the Packers, Adam H. Beasley of the Miami Herald reports. Jones pulled himself out of Sunday's 13-8 win over the Jets, Cameron Wolfe of ESPN.com reports. Analysis: Jones' reasons for exiting the Week 9 contest remain undisclosed but Armando Salguero of the Miami Herald indicates that drama appears to be brewing in Miami's secondary room. Rookie first-round pick Minkah Fitzpatrick is expected to continue slotting into the starting lineup as long as Jones remains out. Not enough is known about Jones' situation in Miami to draw any long-term conclusions, but the two-time Pro Bowler's continued role with the Dolphins appears to be in question. Jones has a partially torn right labrum but will continue to play through the injury, Adam Beasley of the Miami Herald reports. Jones compiled a team-high eight tackles (seven solo) during Sunday's 27-17 loss to the Bengals. Analysis: Jones had missed Miami's last two contests with a shoulder injury before returning Sunday versus the Bengals. The 30-year-old safety made an immediate impact, as he led the team in tackles. Jones has 18 total tackles and two interceptions in three games this season. Jones (shoulder) is active for Sunday's Week 5 tilt against the Bengals. 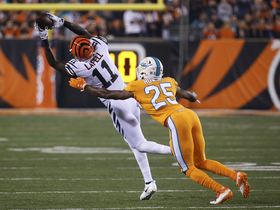 Analysis: Jones' return to action after a two-game absence is especially timely, considering the Dolphins must deal with a high-powered Bengals passing attack in Sunday's contest. The Pro Bowl safety's presence was especially missed in a Week 4 blowout loss to the Patriots when Tom Brady lit up the Miami defense for 274 yards and three touchdowns. Jones (shoulder) is listed as questionable for Sunday's game against the Bengals, Armando Salguero of the Miami Herald reports. Jones (shoulder) was a full participant in Wednesday's practice, Armando Salguero of the Miami Herald reports. Analysis: Jones has been sidelined for the last two weeks with the shoulder issue, but his full session to open Week 5 preparations suggests he's likely in line to play Sunday in Cincinnati. Minkah Fitzpatrick had filled in as a starter alongside T.J. McDonald while Jones was out, logging 20 tackles, two pass breakups and an interception in those two contests. Jones (shoulder) is inactive for Sunday's Week 4 tilt against the Patriots. Analysis: Jones was deemed likely to miss Sunday's contest despite putting in two full practices to finish off the week, and Sunday's inactives report confirmed that notion. First-round pick Minkah Fitzpatrick is expected to fill in for Jones for a second straight week. 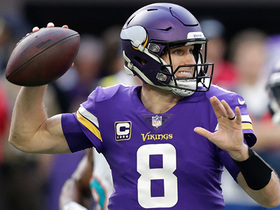 Jones (shoulder), who is listed as questionable for Sunday's game against the Patriots, is considered unlikely to play, Jeff Darlington of ESPN.com reports. Analysis: The safety's status will be verified as the 1 p.m. EDT kickoff approaches, but it looks like he'll miss out on a second straight game despite turning in two full practices this week. Jones' expected absence will likely open up extended snaps for Minkah Fitzpatrick once again. Jones (shoulder) is questionable for Sunday's game against the Patriots, Adam H. Beasley of the Miami Herald reports. Analysis: Jones was sidelined for Miami's Week 3 win over the Raiders due to a shoulder injury, but he's managed two full days of practice to end the week. 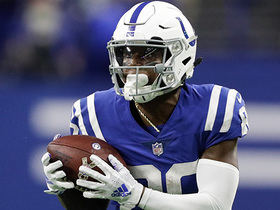 The starting strong safety appears to be trending towards suiting up against the Patriots on Sunday, but his availability remains unconfirmed. Jones (shoulder) was a full participant in Thursday's practice, Adam H. Beasley of the Miami Herald reports. Analysis: Jones missed Week 3's tilt against the Raiders due to a shoulder injury, but he appears to be progressing in his recovery. It remains to be seen whether Jones will suit up for Sunday's game against the Patriots, but the starting strong safety is trending in the right direction. Jones (shoulder) is uncertain to play Sunday against the Patriots, Armando Salguero of the Miami Herald reports. Analysis: After he was sidelined during the Dolphins' Week 3 victory over the Raiders, Jones was on the practice field Wednesday, but managed only a limited session. 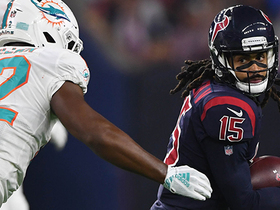 He'll likely need to put in a full session either Thursday or Friday for the Dolphins to feel optimistic about his availability for Sunday's matchup. Minkah Fitzpatrick would pick up another start at safety alongside T.J. McDonald if Jones can't go. Jones (shoulder) is inactive for Sunday's game against the Raiders. Analysis: Jones was able to get on the field as a limited participant in practice Thursday and was questionable entering Sunday. Look for Minkah Fitzpatrick and Walt Aikens to see extra reps while Jones sets his sights on a Week 4 return. Jones (shoulder) will be a game-time decision for Sunday's game against the Raiders, Cameron Wolfe of ESPN.com reports. Analysis: Jones was a limited participant at practice Thursday after sitting out Wednesday's session with the shoulder injury. Walt Aikens and rookie Minkah Fitzpatrick could both see increased snap counts if Jones is ultimately ruled out Sunday. Jones (shoulder) was a limited participant in Thursday's practice, Armando Salguero of the Miami Herald reports. Analysis: Jones managed to log a limited participation Thursday after being unable to practice to begin the week. One of Miami's top defensive players, Jones should still be considered questionable to suit up for Sunday's game against the Raiders. If the starting strong safety were to miss any time, Walt Aikens and rookie Minkah Fitzpatrick would both see increased defensive roles. Jones was a non-participant at Wednesday's practice due to a shoulder injury, Armando Salguero of the Miami Herald reports. Analysis: Despite being present at Miami's facility Wednesday, Jones was confined to the sideline for the team's first practice session of the week. The severity of Jones' injury remains unclear, but the Dolphins' practice reports Thursday and Friday should prove more telling toward his status for Sunday's game against the Raiders. If Jones is unable to suit up, rookie Minkah Fitzpatrick would be in store for increased snaps at safety alongside T.J. McDonald. Jones was not on the field for practice Wednesday despite being at the facility, Jason Lieser of the Palm Beach Post reports. Analysis: The team hasn't released any information regarding his absence at this point, so it's best to consider him day-to-day and questionable ahead of Sunday's matchup with the Raiders until more surfaces. If he's unable to go, either Walt Aikens or rookie Minkah Fitzpatrick would likely get a start at safety opposite T.J. McDonald. Jones recorded seven tackles and two interceptions during Sunday's 27-20 victory over the Titans. 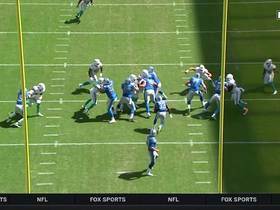 Analysis: Jones was arguably the player of the game, with his second pick -- and the subsequent 52-yard return -- leading to a Dolphins field goal that essentially sealed the game for Miami. 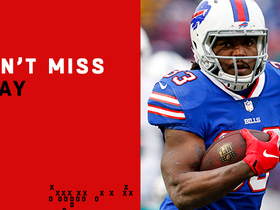 Jones only has three picks in his last two seasons combined, however. Therefore, while it's not a great bet to expect this level of ballhawking on a game-by-game basis, Jones also has been on a 100-tackle pace each of the past five seasons and should continue to be a reliable source of production in that department. Jones agreed to restructure his contract with the Dolphins, Field Yates of ESPN reports. Analysis: Jones didn't take a pay cut by any means but effectively gets a $4.05 million bonus while creating roughly $6.6 million in cap space for the Dolphins. It's a win-win situation for player and team alike that should allow Miami to field a more competitive team around Jones in 2018. Jones accumulated 122 tackles, five PBUs, two interceptions, two touchdowns and three fumble recoveries in 2017. Analysis: Jones topped the 100-tackle threshold for the third time in the past five years -- and the two times he didn't achieve the feat in that span occurred during injury-shortened seasons. The veteran is about as consistent as they come as an IDP option and doesn't appear to be slowing down with age. He's still under contract with Miami for years to come and should return in 2018 as one of the top fantasy options at defensive back. Jones made 15 tackles (12 solo) and defensed a pass in Sunday's 29-13 loss to the Chiefs. 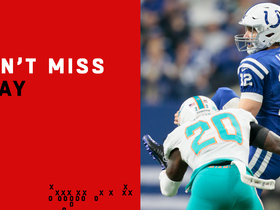 Analysis: The tackle total was his season high by two, and the pass defensed was his fifth of the season. He'll be a good IDP option at safety despite a difficult Week 17 matchup against Buffalo. Jones (back) is active for Sunday's game against the Broncos. 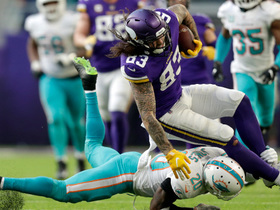 Analysis: Jones was a late addition to the Dolphins' injury report, but it doesn't appear as though the issue is serious. Jones is expected to start, with Michael Thomas slated to see some extra reps if Jones is at all limited. Jones is listed as questionable for Sunday's game against the Broncos, Armando Salguero of the Miami Herald reports. Analysis: Jones was absent from the injury report all week so the specifics of the injury remain unclear. 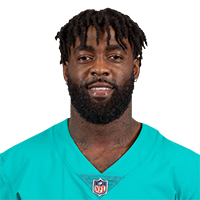 Maurice Smith (abdomen) was placed on injured reserve Saturday and Michael Thomas (knee) is also listed as questionable, which could leave the Dolphins extremely shallow in safety depth. Jones had 12 tackles and returned a fumble for a touchdown in Sunday's 35-17 loss to the Patriots. Analysis: The 12 tackles were the most that Jones has had in a game this season, while his touchdown was his second of the year. Jones is on pace to record the second-best tackle numbers of his career and has been a reliable safety for Miami throughout the season. Jones had nine tackles and an interception in the Dolphins 27-24 loss to Oakland on Sunday. Analysis: Jones is having a solid season with 55 tackles, three passes defensed, two fumble recoveries, two interceptions and a touchdown in eight games for Miami. He should continue to start at safety for the remainder of the season. Minnesota Vikings tight end Tyler Conklin catches a 20-yard dart from quarterback Kirk Cousins. Minnesota Vikings tight end Tyler Conklin leaps to catch a 33-yard dart from quarterback Kirk Cousins. 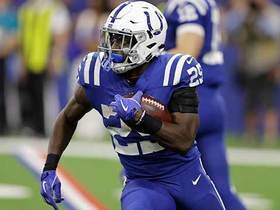 Indianapolis Colts running back Marlon Mack rushes for a 25-yard gain. Detroit Lions running back Kerryon Johnson gets loose again for a 71-yard gain.